A hundred years ago this week… A temporary petering-out stage prevailed on most fronts. The Third Battle Of Ypres (or Passchendaele) remained bogged down by the weather, but still the opposing Armies exchanged deadly raids: the British halted their own attack on the Gheluvelt Plateau because of the mud (August 27), advanced 200 yards across the St Julien to Poelcapelle road (27) then lost the ground again (31), but repulsed German counterattacks southeast of Lens (30) and at Havrincourt southwest of Cambrai (September 1-2). On the Eastern Front, one major new eruption began, the Battle Of Riga or Jugla in Latvia (September 1-3). The German Army bombarding Russian and Latvian forces across the River Daugava (or Dvina) and advanced via pontoon bridges. However, an orderly retreat was contrived – although it involved surrendering Riga – via the courage of the Latvian Rifleman Brigade holding the line for 26 hours while the rest of their troops retreated to Sigulda and Celsis. The casualties told the story: 5,000 German, 25,000 Russian/Latvian. In Romania, while the Battle Of Marasesti had wound down by September 3 (casualties Romanian 27,410, Russian 25,640, German 60-65,000, Austro-Hungarian unknown), at the same time the revived Romanian Army continued its effective resistance in the Vainitza region and the Ocna Valley (not helped by a Russian Division laying down their arms rather than supporting them – this betrayal caused by political upheaval back home and resultant lack of food and money on the Russians’ various and scattered front lines). The 11th Battle Of The Isonzo saw the Italians in the ascendency still, if not making further great strides, as they beat off Austro-Hungarian counterattacks on the Bainsizza Plateau and at Monte San Gabriele. And a report to London averred that down in German East Africa British and Belgian forces (often abetted by South Africa and Portugal) were still driving the Germans out of the massive territory which later became Tanzania, Burundi and Rwanda. 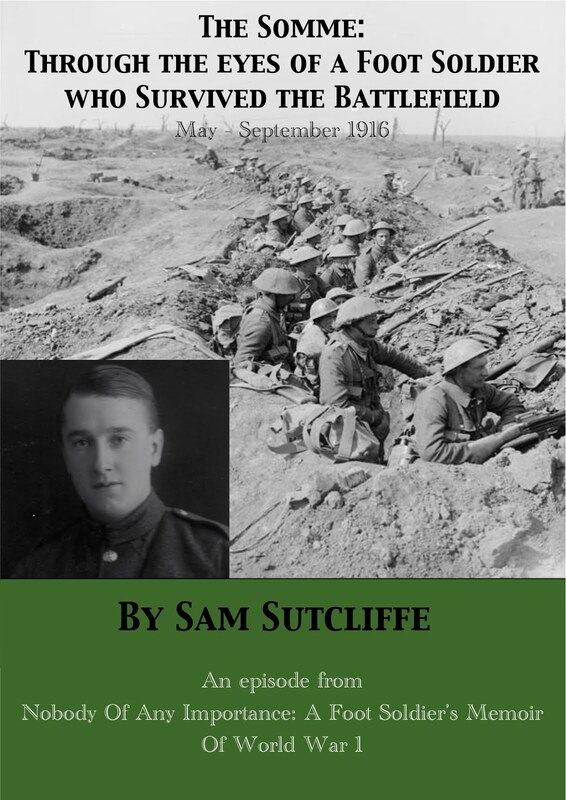 Meanwhile, I felt it might be of interest even to longer-term readers to rerun some excerpts from his Memoir sections (and the Gallipoli and Somme e-bookette episodes) on the historic battles he observed from the front lines and, as he always insisted, through the eyes of one soldier – not a historian, “just” a Tommy participant. 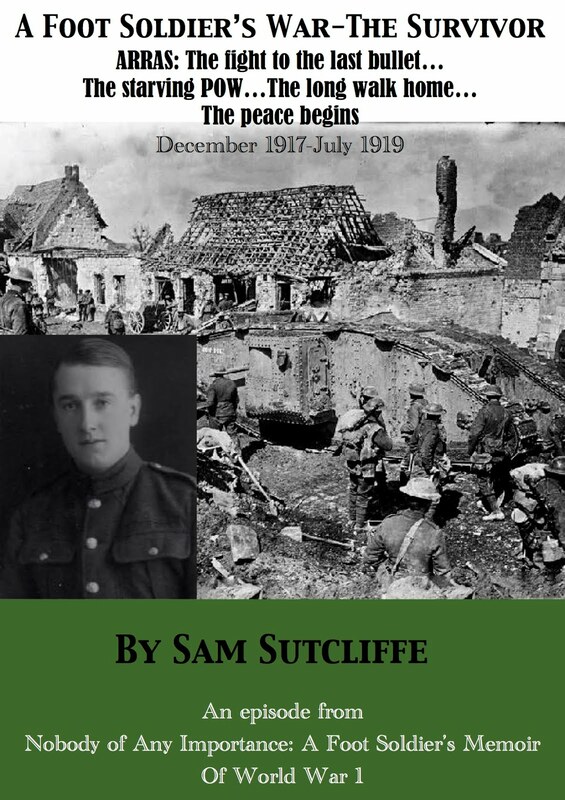 Here, then the first sequence of key moments from Sam’s Gallipoli, his initiation into the realities of war. ‘And there I was, high up on the deck of a ship, chatting happily with brother Ted and looking downwards at men still climbing up the steep gangway, loaded with full equipment. Ted sat on the deck, his back against a cabin wall, obviously somewhat uneasy. This actually pleased me, I recall, because if my strong, assertive older brother could feel like that, I could be excused for worrying a bit. At long last, only five or six of our men remained on the Quayside and now I felt quite confident about the future, doubtless encouraged by Ted’s presence with me on a ship about to take us — where? With barely time to shake hands, he was hustled off and down the gangway. I kept him in sight. We waved goodbye during all the time we could still see each other. Gone was the happiness which had returned to me when we so fortunately got together on that ship. Now I felt only the grim prospect of a very difficult and doubtful existence for an unknown length of time in some strange land. I felt very sad until a chap who had witnessed Ted’s departure revealed a good side of the affair. “He’ll be all right whatever happens to you, the lucky devil,” he said. And I thought, that was how I felt about it, and I hoped Ted would remain in Egypt for the duration of the war. ** An alias – for reasons known only to him, on the rare occasions when my father uses his family name “Sutcliffe” is thinly disguised as “Norcliffe”. By the way Ted’s front teeth got punched out in a fist fight – he always was something of a scrapper. *** My father wrote from experience, of course, and apparently without sarcasm here, but various sites reveal a critical consensus either abusing the Aberdeen-based victualler’s stew – “An inferior grade of garbage,” says one – or noting noxious side effects: “The Maconochie stew ration gave the troops flatulence of a particularly offensive nature” (from David R. Woodward’s Hell In The Holy Land, published by the University Press Of Kentucky, 2006, quoted with permission from Dr Woodward). **** Mudros: sometimes spelt Moudros, on Lemnos; the island had become Greek, and a Greek Navy base, in 1912, as a result of the First Balkan War (the Ottoman Empire versus Serbia, Greece, Montenegro and Bulgaria); Allied Navies used it from 1915 until the end of World War I. ***** My father’s Battalion landed at Suvla Bay, Gallipoli, on September 25, 1915, joining the 88th Brigade of the 29th Division. 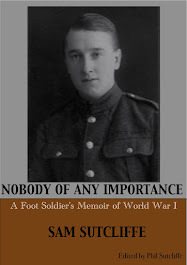 In Strong For Service, H Montgomery Hyde’s biography of Lord Nathan (the 2/1st’s most popular officer and in the later months of Gallipoli their CO, after brisk promotion from Lieutenant to Major – he later served as a Minister in Attlee’s post WW2 Labour Government), the author refers to a “late afternoon” landing, which is not my father’s recollection, as you see – but different Companies (two per ship, eight in the Battalion) landed at different times, and Hyde writes that “Nathan was the first person in the Battalion to set foot on Turkish soil”, whereas my father in H (the eighth) Company may well have been one of the last. The Allies’ Gallipoli landings had begun on April 25, 1915, and the Suvla Bay phase on August 6. ‘Word passed around for all to be ready to disembark and I donned my load, message case, field transmitter, rifle and all – in one hand I gripped a bunch of four signal flags. Whether excitement or fear brought it on I don’t know, but I suddenly felt terribly hungry. Then I recalled that I had not eaten since early morning. Nor, as far as I know, had any of our men. Someone had blundered. Or was it usual to land troops on a battlefield with empty bellies? The sound of the ship’s engines changed. We four H Company Signallers stood shoulder to shoulder with the others awaiting the next move. As Lance Corporal in charge of our small group, I knew that our job would be to supply communication between our Company commander and Battalion headquarters, and perhaps between us and Companies on our right and left. Runners would carry messages between platoons and Company HQ. So I located our Captain and resolved to keep close to him and to have my mates close to me. Ever since our Signals Section had been formed back there in Malta, I had not had much to do with H Company, and the good Captain had not been really aware of my existence. He had his intimates – usually two junior officers and his batman; he called on his Company Sergeant Major in respect of drills and training and procedure when on parade, but as to Signallers he knew nothing, nor did he seem to wish to. 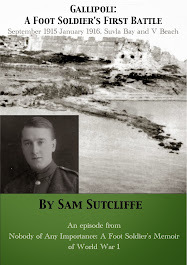 Next week: Sam and pals land at Suvla Bay, under fire for the first time in their lives – and suffers their first deaths. A hundred years ago this week… The Third Battle Of Ypres/Passchendaele (July 31-November 10) stalled to a degree because of more heavy rain, but British troops made a couple of advances including the capture of German positions east of Hargicourt, northwest of St Quentin (August 22-26). However, the Canadians committed what’s commonly regarded as a tragic error in trying to extend the Battle Of Hill 70 success to take the town of Lens – a failure with heavy casualties, some inflicted by the Germans’ new mustard gas (21-22). Further south, unhampered by the weather, the French launched the Second Offensive Battle Of Verdun (August 20-26) and moved rapidly through their list of objectives, taking Avocourt Wood, Mort Homme, Hill 240 (23-24), Hill 304, Bois Canard (25) and reaching the outskirts of Beaumont (26; French casualties 14,000, German unknown). While the Russian retreat on the Eastern Front continued, especially in Latvia, their supportive action alongside the Romanian Army bore some fruit as they helped to beat back a week-long German counterattack and protect gains made in the Battle Of Marasesti (August 6-September 3), and did likewise as the Battle Of Oituz settled into a stalemate (August 20). Meanwhile, Italy’s opening onslaught on the Austro-Hungarians in the 11th Battle Of The Isonzo (August 18-September 12) progressed well as they occupied Korite and Sella (August 20), Monte Santo (25) and most of the Bainsizza Plateau, their main target. Back home, one of those minor landmarks which meant nothing at the time occurred when German planes bombed Dover, Ramsgate and Margate (August 22; 12 killed, 25 injured) – this turned out to be World War 1’s last German daylight raid on the UK by aeroplanes. Last week a hundred years ago, still lodging in tented encampments on their route march, my father and his comrades took medicals which they regarded with some ambivalence given the common talk was that an “A1” fit-and-healthy verdict amounted to a “death sentence” via imminent dispatch to the battlefield (for the first time in many cases, though not for the formerly underaged veterans like Sam). But no clarity ensued for my father. Judged “A1 conditionally” because of his erratic temperature and intermittent bouts of “lassitude” – the less conspicuous outcomes of his months at Gallipoli and the Somme? He was sent to a Sheffield hospital (probably Wharncliffe War Hospital, though he doesn’t name it) to be “built up”. ‘She drew a curtain aside revealing a small double-bed and, to liven things up a bit, I pretended I was a lascivious villain and had at last got a maiden in me power and would have me way with her come what may. Laughing and giggling at this unlikely idea, we acted out the scene, then came to the part where I picked her up – thankful she was so tiny – and flung her at the bed. Probably she grabbed at the curtain but, whatever caused it, down came part of the drape, torn from the rings on the rod above. Her relatives might have arrived at wrong conclusions about our conduct, so needle and cotton had to be found and the curtain re-hung. After valuable time had been wasted on that job, we had time only to rush through the lovely strawberry tea which someone had prepared and stored in a food safe for our enjoyment. Then we had to hurry back to hospital. Another day, we spent the few hours of freedom I was permitted at a cinema, followed by tea in Rotherham at Flo’s sister’s house in a quiet cul de sac. Nothing exciting happened, but again these close contacts with civilians still living normal lives found me very appreciative, though always uneasy somewhere inside. In the hospital ward, I made two good friends – Foxon, and the other name won’t come back to me – both local lads, from opposite ends of Sheffield. Foxon invited me to accompany him to his home one afternoon. We walked uphill, to Eccleshall, a district obviously inhabited by well-off people. Foxon’s family lived in a detached house standing in grounds with trees and shrubs; Dad, who shook hands and made me very welcome, wore a black morning coat – the long, cut-away type – and striped trousers, a shirt with a fairly high, white, butterfly collar, and a grey tie. Foxon, like me, wore the shapeless hospital-blue two-piece, so I felt at no disadvantage. We spent an hour or so talking, drinking milky coffee, and eating little sugary pastries. Just as friendly was the family of my other pal. They lived in a terraced house somewhere off the Attercliffe Road and I enjoyed a happy afternoon there with his mother and sisters. On a fine day, a concert party entertained us soldiers in the park-like grounds of the hospital. The comedian did well with a George Robey** song and followed that with I Ain’t Never Got Nothing From Nobody, performed in a funny, forward-leaning, eyeball-rolling style which amused some and sort of scared others who weren’t so sure that the man was really sane. After that, reassuringly, children from a ballet school danced prettily on the well-cut lawn. ** George Robey: “The Prime Minister Of Mirth”, 1869-1954, music hall star from Kennington, London; his best-known song was If You Were The Only Girl In The World and his catch phrase “Kindly temper your hilarity with a modicum of reserve”; he raised £500,000 for war charities during World War I; Nobody (the correct title), written in 1905 by Bert Williams (1874-1922, the best-selling black American recording artist pre-1920; W.C. Fields called him the funniest and the saddest man he knew) and lyricist Alex Rogers (no dates and little other information on him except he was a black vaudeville performer, no references to him after 1924), for a Broadway show, Abyssinia which featured real, live camels; lyrics include “When all day long things go amiss,/And I go home to find some bliss,/Who hands to me a glowin’ kiss?/Nobody/… I ain’t never got nothin’ from nobody, no time!/And until I get somethin’ from somebody, sometime/… I don’t intend to do nothin’ for nobody, no time!”; later recorded by Bing Crosby, Nina Simone, Ry Cooder, Johnny Cash.